The main breeds for meat production are Muscovy, Aylesbury, Pekin and Rouen. Various crosses between these four pure breeds are also suitable for meat. Most ducks produced commercially for meat in Australia are Pekin/Aylesbury crosses—the cross is predominantly Pekin. Fanciers often claim there are no purebred Aylesbury ducks left in Australia, and that what is commonly termed Aylesbury is in fact a Pekin. 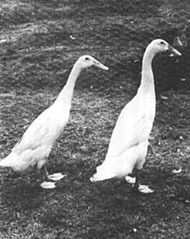 Both the Aylesbury and Pekin are called ‘English ducks’. They are marketed earlier than Muscovies as ‘green’ ducks. (‘Green’ refers to ducks before they develop adult feathers.) Although Aylesburys are not good layers, they do lay better than Muscovies, and do not go broody. Their eggs may be greenish white. Head — Large, straight and long. The white or flesh-coloured bill is 15–20 cm long and is almost straight in line with the top of the skull. Body — The breast should be very prominent and the body long, broad and deep. The tail is only slightly curved. The keel bone should be practically parallel with the ground, and the carriage horizontal. This breed moves with a slow waddling gait. Legs — Well set to balance the body. Are short, strong and bright orange. Colour — The pure white plumage should be bright and glossy. Although only used commercially for meat production, Pekins are better egg producers than the Muscovy and Aylesbury. This breed originated in China and is the most popular breed in the USA and the UK where much genetic improvement has taken place. Pekins or Pekin/Aylesbury crosses are also the most popular commercial meat ducks used in Australia. Like the Aylesbury, Pekins seldom go broody. They are a nervous breed and need to be handled carefully so that egg production and rate of weight gain are not affected. Very good meat-producing ducklings can be bred by crossing Pekins with Aylesburys. The progeny have a high degree of hybrid vigour and are easily reared. Head — Large, broad and round. The bright orange bill is short, broad, thick and slightly coarse. The eyes are partially shaded by heavy eyebrows and are dark lead blue. The neck is long and thick, and is carried well forward in a graceful curve, with a slight gullet in the throat. Body — Broad and of medium length, with only a little keel between the legs; it is shorter than the Aylesbury. The stern should be carried just clear of the ground. The tail should be well spread and carried high; in the drake, it has two or three curled feathers on top. The chest is prominent and the carriage upright, sloping down at the rear. Legs — Should be strong and set well back to allow for the erect carriage of the body. The legs and feet are bright orange. Colour — The plumage is a uniform deep cream or buff canary colour. Bright yellows generally indicate yellow flesh, which is not popular with processors. The Rouen, originally from France, is the least popular of all table breeds because it is the slowest to mature and has dark flesh. Its most outstanding feature is its magnificent colour and markings, a throwback to the Mallard duck from which it originated. The female differs in colour from the male. Head — The head is massive. The bill is long, wide, flat and bright green-yellow, with a black bean at the top. The neck is slightly curved. Body — The body is square, long and broad, with a very deep breast. The carriage is horizontal, with the keel parallel to and just clear of the ground. Legs — The brick-red legs are of medium length and are well set to balance the body. Colour — The drake’s head and upper neck are a rich iridescent green with a white ring that divides the neck and breast colours. The breast is a rich claret. A pencilling effect is created by grey feathers on the underpart and sides; the back and tail are rich greenish black. The duck’s head and neck are rich brown; the rest of the plumage is a similar colour, with black or greenish black pencilling. Ducks are very hardy and can produce good egg numbers for three seasons. There are two main egg-producing breeds: Khaki Campbell and Indian Runner. There is very little difference between them, but the Khaki Campbell may have a slight advantage because it is a bit larger and so has a better carcase resale value. Outstanding egg production has been achieved from individual birds that have laid 365 eggs in as many days. But ducks are difficult to manage in large numbers and do not produce eggs as economically as do hens. The albumen of duck eggs is slightly thicker than that of hen eggs, but most people cannot detect the difference between the two. This breed originated in the East Indies (Malaysia and China). The most popular and common varieties in Australia are the fawn, the white, and the fawn and white. The other two varieties are the black and the chocolate. Apart from its small frame, the breed is distinguished by an almost upright stance and the running gait from which its name is derived. Head — Typically racy in appearance, with a wedge-shaped bill, the skull flat on top, and alert eyes set high. The fine, long and graceful neck is carried almost in line with the body. Body — Slim, long, rounded and cylindrical. When the birds stand still, their carriage is almost perpendicular to the ground. The angle of the body can vary from about 50° to 90°. Legs — The thighs are generally longer and stronger than in other breeds, and the legs must be set well back on the body to allow for the upright carriage. Fawn variety: There is little variation in the colour throughout the whole body. Legs and feet are yellowish brown. The pigmentation is slightly brighter in the drakes. White variety: The plumage is pure white and free from any markings; the bill, legs and feet are orange. Fawn and white variety: A white line divides the bill from the head and runs from the eyes to the pure white neck. Another white area extends from the breast, between the legs and beyond the vent. The rest of the body is fawn. The lower part of the wing, primary and secondary flights are pure white. The bill, legs and feet are orange. 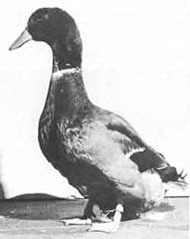 The Khaki Campbell was originally bred by a Mrs Campbell in England, by crossing a Rouen drake with a fawn and white Indian Runner duck to establish a dual-purpose breed. It is not a satisfactory producer of meat — the rather dark flesh has a typical ‘game’ flavour. However, it is quite hardy. It lays eggs with a pearly white shell and is preferred by most breeders for commercial egg production. Head — The head is carried high and is rather fine in texture. The neck is slender and carried almost erect, and the bill is set nearly in a straight line with the top of the skull. Body — The body is deep, compact, and fairly wide. The back is slightly sloping with the abdomen well developed but not sagging; carriage is slightly upright. The bird should be free from coarseness. Legs — The legs and feet of the drake are dark orange, and of the duck are khaki. Colour — The head and neck of the drake are greenish and the rest of its body is khaki brown. The bill is dark green. Ducks and immature drakes are an even khaki colour, and the bill is greenish black. Table 1. shows the typical weights of adult birds for both the meat breeds and the egg breeds. The trap nests are designed so that a duck can go into the nest but cannot get out until released by the operator. This allows the operator to record that an egg has been laid and to identify, by its wing or leg band, the bird that laid the egg. age of marketing at a suitable weight. The leg and bill colour is bright in young ducks — in older ducks, it is dull and there is a hardening of the skin. Young ducks have a pliable, gristly breastbone — the breastbone of the older ducks is rather hard. The windpipe of young ducks is soft and easily dented — it is difficult to dent the windpipe of older ducks. To achieve the greatest genetic progress, the time between generations (the ‘generation interval’) should be minimised. First-year ducks and drakes are the best — do not mate birds younger than 6 months of age. The ratio of the number of ducks to one drake is governed by the breed, age, and the method of management. Fewer ducks can be mated to a drake when the birds are housed intensively. With the heavy breeds, such as the Muscovy, a ratio of one drake to five ducks is required. 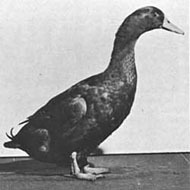 With the lighter breeds, such as the Khaki Campbell, one drake to ten ducks may be sufficient. The number of birds to be mated depends on the number of ducklings you want. With most breeds, one duck can produce about 100 marketable ducklings per season — selected strains will produce more. To give both ducks and drakes time to settle down, they should be mated for 2 weeks before eggs are collected for setting. This will enable proper mating to occur and help ensure high fertility in the eggs laid. The smaller the number of birds mated and housed together, the better the results. For economic reasons commercial breeders have to practice mass matings.